As demonstrations continue to disrupt normal operations in Hong Kong, both experts and residents are considering the long-term impact that pro-democracy protest will have on the international finance hub. Police have used pepper spray and tear gas in an effort to oust protesters from their camps near Hong Kong's main business district, but the activists remain in place and have even occupied main roadways in other neighborhoods. The protesters want free and open elections in the Chinese territory, while Beijing has proposed a process that would essentially allow it to screen candidates for the city's top office. The protests have closed some schools and office buildings, and 21 banks have closed branches or ATMs. The benchmark Hang Seng has shed nearly 6% over the past five trading days. On Monday, the Hong Kong Monetary Authority said it was standing by to provide additional liquidity if required. Critics worry that the protests threaten Hong Kong's status as a global business hub and a beacon of stability in Asia. Should the protests continue, some experts warn that retail sales will suffer, the housing market could take a hit and Hong Kong's economy could slide into a recession. "There is also a risk that Hong Kong's economy could suffer more lasting damage, especially if the authorities decide to crack down on the demonstrators," analysts at Capital Economics wrote in a research note. 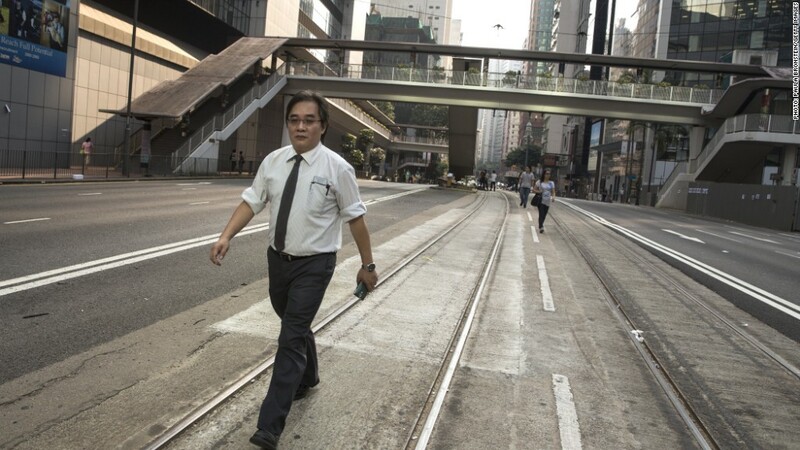 A man walks to work on an empty street in Hong Kong, cleared as pro-democracy protests continue to expand in the city. A British colony until 1997, Hong Kong rose to prominence as a center for regional commerce that acted as China's gateway to the world. That reputation stuck even after Hong Kong was returned to China, becoming a "special administrative region." Businesses here face fewer restrictions than they would on the mainland, making it an attractive place to set up shop. Many large multinational companies even make Hong Kong their regional headquarters. Chinese firms have also looked to Hong Kong as a way to expand their reach abroad. Hong Kong is the single largest source of foreign capital for Chinese enterprises, and mainland firms represent about 56% of the total market cap of companies traded on the Hong Kong Stock Exchange. But Hong Kong's status and reputation is not guaranteed, and some residents fear the territory's advantages are slipping away, especially as mainland Chinese cities rise in stature and some international firms choose Singapore as their headquarters. Some protesters say they see lasting damage to Hong Kong -- but only if the government doesn't begin to make amends. 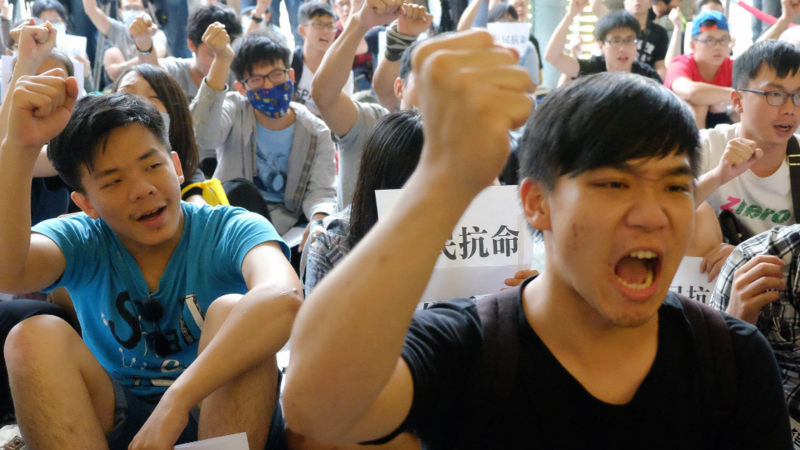 "I don't think [businesses] will be threatened ... if the government can address our problems correctly [and] Hong Kong can become more democratic," said Denise Li, 19. "If not, international businesses may start to think that Hong Kong is not a very open city, and the government will protect Chinese [companies] only." Others fear that foreign investment will dry up. "I think foreign investors may be afraid of the future in Hong Kong," said Sammi Mak, 18, a business student at a local university. "Hong Kong is known for freedom, the inflow of information, and now China is taking over everything, and Hong Kong may lose this advantage compared to other cities." Benny, a 21-year-old who declined to give his last name, said the protests are not yet a big problem for the business community. "I don't think business is harmed within Hong Kong," he said. "Right now, everyone is going to work, everyone is doing their normal job." Fitch Ratings said it doesn't expect the protests to last long enough to have much of an effect on the city. But Fitch sees problems ahead if the government no longer commands popular consent or the protests do significant damage to the perception that Hong Kong is a stable and attractive investment destination. "But those questions will likely be answered over months or years rather than days," the ratings agency said.